For several weeks, I was reading deeply into the history of the cavalry branch of the Army of Northern Virginia. I am writing a history of a cavalry battalion attached to that command. However, I have discovered that my focus needed to shift. Lately, I've been reading more on the headquarters staff of the ANV. 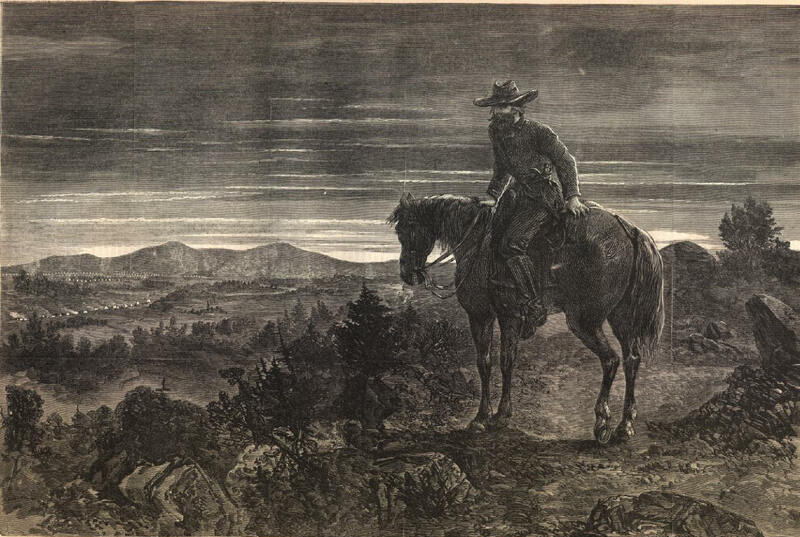 They were the men who came into daily contact with the 39th Battalion Virginia Cavalry. There are a couple of good books on staff operations: Bartholomees's Buff Facings and Gilt Buttons comes to mind. Most of my reading has been more focused on the letters of staff officers - Walter Taylor, Thomas Goree, and Jedediah Hotchkiss, just to name a few. 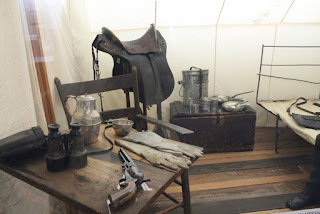 Given the number of men involved in the Army of Northern Virginia, there are surprisingly few accounts of what those headquarters actually looked like. Well, maybe it is not that surprising. The common soldier in the ranks, and his regimental or brigade commander, would seldom see the headquarters complex. They were busy with their daily routines, and Lee's staff went to great lengths to keep Lee from their gaze. We are left with a few descriptions of what the ANV headquarters looked like. Francis Dawson, a member of Lt. Gen. James Longstreet's staff, disagreed with Taylor about the lack of bunting being displayed. He wrote after the war that there "was no pomp or circumstance about [Lee's] headquarters, and no sign of rank of the occupant, other than the Confederate flag displayed in front of the tent of Colonel Taylor." There are many cases of Lee being offered a house to use. Early in the war, he often refused. Even the famous Lee's Headquarters House at Gettysburg appears only to have been used for meetings. Lee's tent was pitched across the street. However, after Gettysburg, when Lee's health began to decline, he did use a house from time to time. For the past few days, I've been reading through Lee's Adjutant: The Wartime Letters of Colonel Walter Herron Taylor, 1861-1865 (edited by R. Lockwood Tower). 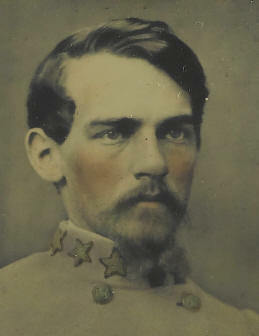 Taylor served on the staff of Robert E. Lee throughout the war. The letters were written (mostly) to his sister and his fiancée. There is much good information in these letters, although from time to time, Taylor writes that he will not bore his loved ones with military matters (I wish he had bored them more!). Taylor writes on May 22, 1864, to his fiancée Bettie that her letters to him could be dropped off at the Adjutant General's office: "a courier comes up from the Adjt Gnls office & can always deliver my letters safely." (161) My question is this: who were these couriers? Were they members of the 39th Battalion Virginia Cavalry, or where they assigned to Gen. Samuel Cooper? This leads to a larger discussion about communication between the authorities in Richmond and the Confederate armies in the field. For now, we will focus on the Army of Northern Virginia. Confederate commands in Georgia, or further west, are a different matter we will look at in the future. Lee's army was close enough to Richmond to be in direct communication. 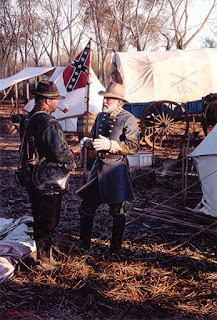 Lee frequently visited Richmond, conferring with Davis about military matters. At the same time, Lee was connected to Richmond via the telegraph. While this is a somewhat grey area in scholarship, it seems that when in stationary or winter camp, dispatches would arrive via the wire. There are several members of the 39th Batt. VA Cav. that state they did duty in the telegraph office, delivering those messages to the commanding general. Speculation on my part: the telegraph office was probably located at the closest railroad depot. An officer or clerk would be present, transcribe the message, and give it to a courier to deliver to headquarters. Telegraph lines, however, could be tapped. Mosby's Rangers did it several times during the War. Important documents undoubtedly were sent by courier to Lee's command. Taylor's letter leads me to believe that the courier service was regular. Of course, he is writing in the midst of the Overland Campaign, when regular telegraphic communications might have been interrupted. Probably one of the most famous was the telegraph that Lee sent the War Department in April 1865, telling the president that Richmond and Petersburg had to be abandoned. Who were these couriers delivering messages and dispatches between the Adjutant General's office and Lee's Headquarters? At this point, I really don't know. I do know that couriers were a vital part of army operations, relaying orders and intelligence not only on the battlefield, but during downtimes as well. From my research so far, it would appear that delivering messages was the prime occupation of the 39th Batt. VA Cav. Of course, many men from traditional regiments were employed as aides and couriers during the war. Brig. Gen. James H. Lane used two of his brothers in this role. One brother was killed at Chancellorsville and the other at Spotsylvania Court House. PS: on September 4, 1861, the Oneida Independent Cavalry Company was mustered into service under the command of Capt. Daniel P. Mann. The company was from New York. They served as escorts, did guard duty, and provided couriers for the Army of the Potomac. They were discharged and mustered out of service on June 13, 1865. This would be the Federal equivalent of the 39th Battalion Virginia Cavalry.